The cyclist was hit near Jay and Tillary streets, police said. 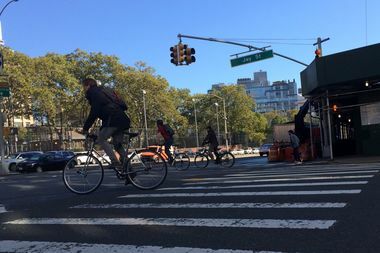 DOWNTOWN BROOKLYN — A cyclist was critically injured when a dump truck hit him Tuesday morning in an intersection that's notoriously dangerous for cyclists, police said. The 35-year-old man, whose name wasn't immediately released, was hit near Jay Street about 7 a.m. as the truck turned from Jay onto Tillary, an NYPD spokesman said. Witnesses heard a scream and saw the man's body lying under the driver's side of the truck. "He screamed. He just started screaming and that was it," said construction worker Tim Meadow, 43. "He was cut up from the waist down. It was tough to look at," Meadow said. Others described a graphic aftermath as well. "The whole road was blood, too much blood," said Farzana Tasmim, 38. "He was awake and in pain. He was lying down. They bandaged him and put him on a stretcher. He didn't say anything," said Tasmim, who works nearby at Concord Market. The cyclist suffered critical injuries and was treated at Methodist Hospital, police said. The cyclist who was hurt Tuesday is the latest in a string of eight cyclist injuries at that intersection since the beginning of 2015, according to city data. Meadow, who's helping build 285 Jay St. nearby, has seen five cyclists get hit during that same time period, he said. Cyclists, he said, don't use their designated bike lane and instead wait to turn in the same lane that other vehicles use. "I've seen five people get hit. You'd think they'd learn," Meadow said. "It happens all the time," he added. The truck's driver, a 35-year-old man who works for Long Island-based Mountain Man Sand and Gravel, wasn't immediately arrested or ticketed, police said. "I actually saw the driver. He came out of the truck. He was trying to understand what happened. He was upset," said Stas Voudiouklis, 21. A man who answered the phone for the trucking company, but would not give his name, said its leadership is aware of the incident. "I cannot speak for the owner, but she is very distraught. She's looking to sit down with the driver and console him any way she can," he said.